We continued our Turkey trip from Göreme to Koya with a couple of interesting stops en route. ▲ As we approached the town of Aksaray the snow-capped volcanic peak of Mt Hasan, Hasan Dağı in Turkish, was clearly visible off to the south. 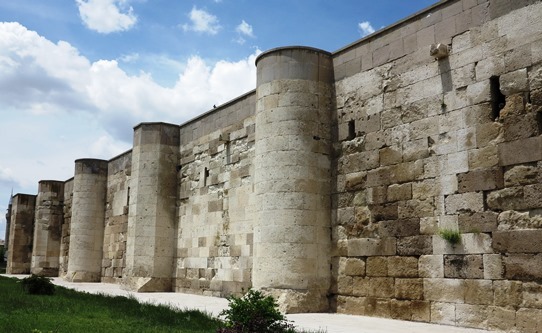 ▲ We paused at the massive Sultanhanı Caravanserai (or han), 42km past Aksaray. The stunning caravanserai is the largest along this old Silk Road route and was constructed by the Seljuks in 1229. ▲ Next stop Catalhöyük was a former GHF site, an agricultural community, nearly as old (well within a thousand years or so) as Göbekli Tepe. There are two excavations, North and South with clustered Neolithic homes which have no street level entrances, the residents climbed in and out on ladders through entrances on the roofs. 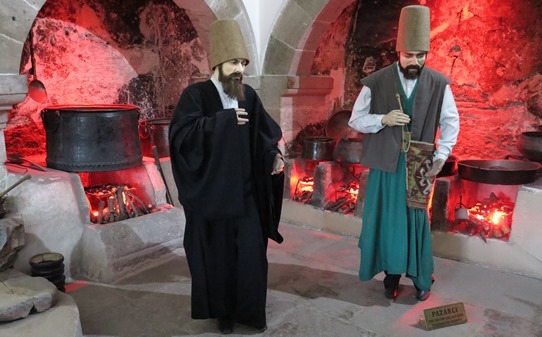 ▲Dervishes in the kitchen, Konya’s big attraction is the Mevlâna Museum which features the mausoleum of Jalal ad-Din Muhammad Rumi, the Sufi mystic who founded the whirling dervishes. The museum features an assortment of dervish exhibits.